As they say, a picture is worth 1,000 words. And this particular picture can save you a thousand dollars, or maybe a million? Move the decimal, the comma, wherever you need. But you surely know the difference between good debt and bad debt. Good debt is where you’ve borrowed to invest in a form of equity that makes you richer or adds to your income. Bad debt is where people are being crushed with interest payments that seem endless and beyond hope. This single picture is from one of my seminars which I offer publicly on financial and retirement planning. The full presentation is at slideshare with a crisp, clear copy on page 12 of what you see below. Inevitably people ask me to spend some time with this so I’m sharing it with you directly too. Here’s the picture, and below I explain further so everything is perfectly clear. Reach me directly if you need further. This picture flows in three simple steps. On the left we meet Pat (man or woman, older or younger) who is struggling to make any progress at all against the interest payments that are due every month. And having to pay taxes before holding any after-tax income adds to the burden. 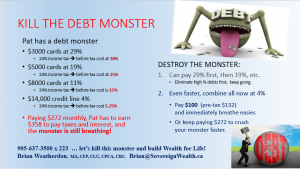 In this picture Pat is having to earn $358 a month in order to net $272 after-tax and pay the current minimum on that $30,000 of debt …and the same monster is there every day, every month, with no hope of vanishing ….ever! On the right side we see a simple and obvious solution. Pat can arrange to focus on clearing the highest interest debts first. Still paying the same amount each month, Pat will make good progress. How enjoyable it will be over time, breathing easier through the year as this monster keeps getting smaller and smaller. A more accelerated approach is to consolidate all the debts with a secured line of credit which today may range from 3% and up. Our picture shows 4%, and Pat’s minimum payment has dropped to just $100 per month ($132 earnings before tax). And by the way if Pat keeps making the same monthly $272 payments this is slashing the debt by $2000 a year! That’s great, and no doubt our friend here is going to find little ways to increase this payment over time to further speed the progress and get DEBT-FREE quickly! Reach me with any questions if I can be of help. Also explore other parts of this website for proven ways to build wealth (an interesting starter is at Sticky Money but also see some of the business-oriented blogs here) and to safeguard the future for Life and Loved Ones. As a FREE GIFT click here for your free copy of PROTECTING LIFE, LOVED ONES, AND FUTURE DREAMS …a self-study, do-it-yourself intro to financial planning. Kindly let me know what you find most helpful, or how we can assist further. Yours in Financial Security for LIFE! Brian Weatherdon, MA, CFP, CLU, CPCA, CRC.